A federal response team has come to Vermont to prepare for what is expected to be a gathering of 10,000 to 20,000 people in the next few weeks in the Green Mountain National Forest of Mount Tabor. Officials with the Green Mountain and Finger Lakes National Forest said they expect as many as 20,000 people. Mount Tabor’s population was 255 in the 2010 census. 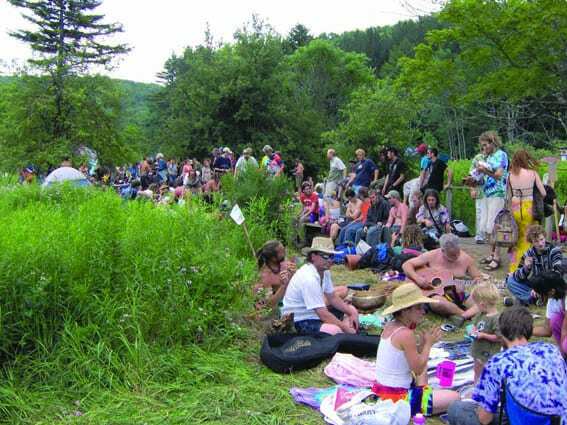 The Rainbow Family of Living Light, an informal organization whose only rule is one of “peaceful respect,” is holding its annual gathering near Danby in the town of Mount Tabor, the U.S. Forest Service said Monday, June 13, in a news release. Visitors are expected to arrive over the next couple of weeks, with attendance peaking during the Fourth of July weekend, the release said. This is the second time the gathering will be held in the Green Mountain National Forest. The first time was in 1991 near Texas Falls in Hancock, according to the Rainbow Family website. The gathering site will be located on Forest Road 10 in Mount Tabor, according to the Forest Service, who warned that an event this size can have significant impacts on traffic and the surrounding communities. Local businesses can expect to see Rainbow gathering participants buying food and supplies along routes to the gathering site, the news release continued. The Forest Service said it has called in its national incident management team, which usually responds to events such as a wildfire or hurricane. But any incident that goes beyond what the local Forest Service personnel can handle on their own requires the team, said John Sinclair, Green Mountain National Forest supervisor. He said that while the Forest Service personnel are coordinating with surrounding communities in preparation for the event, their primary focus is the impact on natural resources. One particular concern is people burying human waste in the ground rather than using portable toilets, he said. Sinclair said he has warned them not to do this near water bodies. It is also bird nesting season, which he said increases his concerns. The gathering must follow conditions and guidelines in a Forest Service operating plan, which Sinclair said is still being drafted. The plan will address public health and safety concerns, minimize impacts on natural resources, and outline post-event rehabilitation procedures, the news release said. “While many members of the Rainbow Family are upstanding citizens, a small segment of their population have reportedly caused significant and detrimental impacts on nearby communities,” the Wasatch County officials said in the letter. Karin Zirk, a Rainbow Family member from San Diego, Calif., said the 2014 gathering wasn’t that bad compared with the gatherings between 2002 and 2008. “Those, to me, were the worst years,” Zirk said. During the 2014 gathering, Zirk said, local people were supportive and enthusiastic and even came out to participate in the event. However, law enforcement was less tolerant, and the relationship between the U.S. Forest Service and the Rainbow Family was more contentious, she said. The Rainbow Family doesn’t have a spokesperson or leader, and there is no real decision-making body, which the U.S. Forest Service doesn’t like, said Rainbow Family member Rob Savoye. Savoye, from Colorado, said he has been a member for 36 years and is the administrator of the Rainbow Family website. “For many decades they have harassed us, jailed us, and done everything they can to demonize us,” he said. “We just want to make the world a better place through our daily lives,” Savoye added. Zirk called the relationship between the U.S. Forest Service and the Rainbow Family “a culture clash.” Zirk also said the Forest Service tends to write a lot of tickets for things that normally would be considered minor infractions, like mandatory court appearance tickets for infractions such as broken taillights or beads hanging from a rearview mirror. The main event is held July 4, when the camp is silent from dawn until noon as participants put their energy into manifesting world peace, Zirk said. People start heading home July 5, Zirk said, though the event isn’t really over until July 7. The Rainbow Family has been holding this annual meeting, which it calls the Rainbow Gathering of the Tribes, since 1972 in a different national forest each year, according to the group’s website. Rob; or Karan: where is the family gathering this July? And do you have any bright ideas on how I cAN GET A RIDE? i LIVE IN sTEAMBOAT sPRINGS. I heard that the family will be gathering in SO. aPPLIACHIA. bUT i DO NOT KNOW WHERE EXACTLY. pLEASE TELL ME. DO NOT haVE A CAR CURRENTLY. If you have any great ideas on how I can hook up with someone with a ride, please let me know.